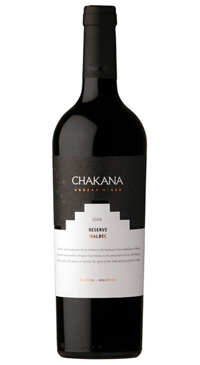 Alberto Antonini a consultant for the Chakana Vineyards first came to Argentina in 1995, after key contributions to the Super-Tuscan movement in the Italy. His philosophy is focused on using modern technology to express the terroir potential in making high end wines, while respecting the true nature of the grape flavours. A dense blue/purple colour is followed by a big, sweet, floral (acacias), blueberry, blackberry, coffee, and white chocolate-scented bouquet. Remarkably rich and heady, with a full-bodied mouthfeel as well as silky tannins.